Big Bad Paddle Battle Boats is possibly the most ludicrous boat-battle arena experience you'll ever have. 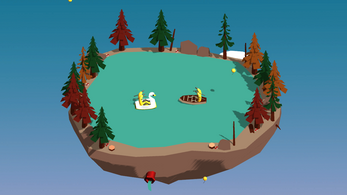 Two player must compete to be the last boat standind in this fast-paced arena madness. Use the magnificent forces of gravity to push your enemy off the edge of the island, and be the Paddle Battle Master! The game requires two xbox controllers. Use the right and left shoulder buttons to control the rotation of the boat. And push 'A' to dash the boat foward in a magnificent sweap.